I returned from Bend, OR, last night and I'm ready to go back. Oiselle held a team running camp, aka 'Bird Camp' there last week and over the weekend, and it was spectacular. 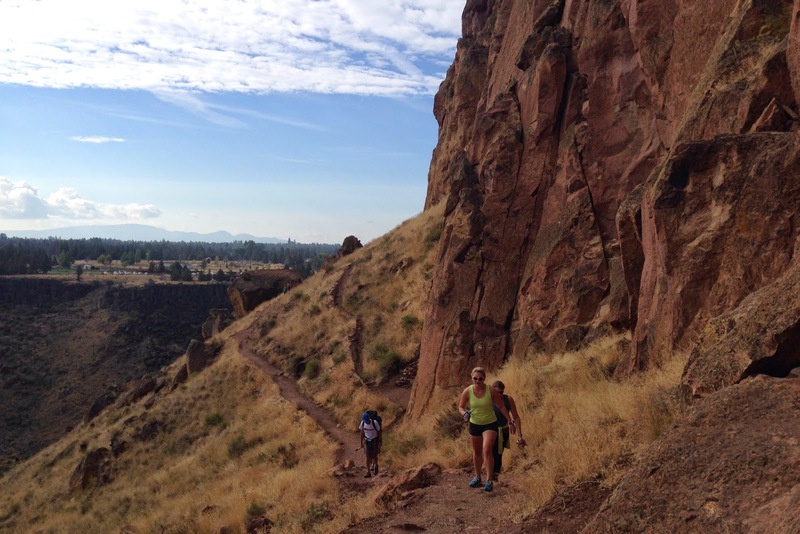 I'm so happy I was able to experience the scenery of running in Bend and the camaraderie of the ladies on the team. I headed to Bend first thing in the morning last Wednesday, and after a long layover in Portland I arrived at Seventh Mountain resort for camp around 1:45 pm. The resort property was beautiful and also happened to connect into the Deschutes River trail. What?! Trail running out my back door? I'd love to have that every day of my life. A few of us went out for to run and explore the area almost immediately, and I was pretty much on a giddy runner's high for the rest of the evening following the trail run. Attempting a selfie of everyone. Deschutes River view from the trail. The following day started with activation exercises taught by Little Wing, which I should really do more often or at least once a week. Many people headed out on a run after that, but I held myself mostly to a hike with friends because we had a 5K race that evening. Hiking with Ayesha and Jessica. Camp included a number of sessions around topics like goal setting, nutrition, training, mobility, and yoga. I feel like I learned a lot and really enjoyed it too. Meeting Stephanie Howe, who recently won Western States, was a big highlight. Later Thursday evening, we headed to the Deschutes Twilight 5K. I used this event as a tempo run and kick off to marathon training speedwork. It was harder than I thought it should have been for the pace - likely due to the altitude - but I feel like I did ok. It was really fun to have so many Oiselle singlets in one place! Post-race they gave us Deschutes Twilight Summer Ale! My kind of race. Hanging out with Farron, Sophia, and Laurel. With my camp roommates Tracy and Jill. We ate at Cafe Yumm after the 5K which was awesome; I'm a big fan of Cafe Yumm! I really like the edamame bowl with tofu, so I even bought my own to satisfy that craving. Yumm sauce is the best. 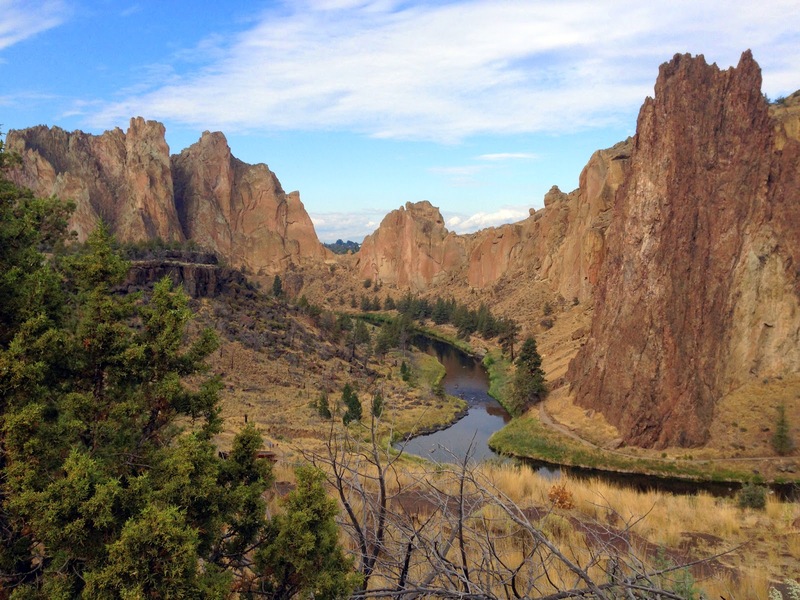 Friday morning brought a trip to Smith Rock, a park with tons of rock climbing routes and trails to run. Friday is generally an off day for me, so I did the shorter 4 mile-ish route up Misery Ridge. I'm not sure why it's called Misery Ridge because it's absolutely beautiful. The climb up was tough but much shorter than I expected, and after that we could run the rest because it was down and flat. I hope to go back there someday. Taking advantage of the photo op. Looking back on the climb up Misery Ridge. With Laurel at Monkey Face rock. Farron on the trail by the river. With Christy, Mel, and Farron after the run. The rest of Friday brought yoga, pool time, form drills, and core work. I was tired but extremely happy by the end of the day. We had burgers for dinner on Friday and then a Q&A session with elites Kara, Lauren, Stephanie, and Kate. I love listening to their stories! Next up was Saturday morning, the long run I'd been waiting for. Running along the Deschutes River trail was gorgeous as always, and I was able to see so much more of the river on the long run. My 12 miler was full of great scenery, slightly rolling trails, river rapids, and Dillon Falls. I have to note I was much more tired at the end than I expected with the lack of climbing, likely due to the other activities and the altitude. I didn't end up running with a big group because I didn't find anyone going my distance at my pace, but I was content to enjoy the trails on my own anyway. I chatted with people as I ran into them. I somehow got off trail on the way out and took a dive on my knees trying to duck under a low tree, but I luckily didn't find that spot on the way back. Note to self: don't try to run while ducking way forward, you will lose your balance. I admittedly dilly dallied a bit and took photos; there was so much new scenery to enjoy. Group running by on the trail. View from the mountain bike trail I climbed accidentally. Worth it! Robyn and Jess coming up behind me. On Saturday afternoon we headed to downtown Bend for sightseeing and a dinner party. I went with a group to 10 Barrel Brewing and then to Deschutes Brewing; Bend has some great beer! Hanging out at 10 Barrel. Last but not least, Oiselle put on a party with tacos and donuts at a local bar called Crow's Feet. Dinner, dessert, beer, dancing, fun people - it doesn't get any better than that. It was hard to say goodbye on Sunday morning, but alas it was time to go home. Bend, I hope to visit again soon! And finally, a photo with the banner! I thought this looked so much fun. I have very mixed views on Oiselle but I have to hand it to them on organising an amazing bird camp. It looks FAB, what a wonderful opportunity for you! So glad you had fun - your photos are amazing. I have to go to Bend - it's my current crush-city!! Well, you know I'm a Oiselle fan and the camp really was great. I learned a lot, ran great trails, and met a ton of people I'd only known from Twitter or email previously. Definitely an impressive and organized event! If I can ever answer any questions for you just let me know. :) And yeah, I felt that altitude! How beautiful! It looks like a fabulous trip!! Paulette, I love your pics! I'm so glad you were able to participate in such an amazing experience; I had a great time following along with so many of you gals via Instagram & Twitter. Thanks so much for sharing! Gorgeous!! Would you mind sharing a bit of what you learned in terms of activation and form drills? That's a really good idea - I can do that in a post! Your pics are fab, Paulette! Fun getting to hang out with you during Bird Camp!!! Gorgeous! Looks like the best camp ever! And it seriously makes me miss Oregon! That looks and sounds like an incredibly funtastic weekend! The pictures of Bend, those trails! and all that beer ;) sounds like my piece of heaven. Glad you had a great time out there. Seeing so many pictures of Oregon trails makes me want to road trip up that way.